I taught for ten years in a public high school. It was a challenge that often sent me home frustrated and discouraged, but for the most part it was a fulfilling experience. For many reasons, I’m glad I started my education career that way. The motive of the questioner notwithstanding, I always felt an obligation to give a good answer. 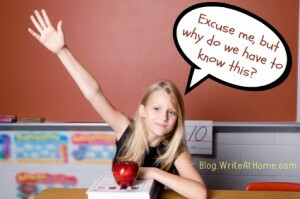 A teacher should know, after all, why he is teaching what he is teaching, right? Why do we have to know this? is in that sense a legitimate question. What troubled me was that some things I taught were tougher to defend than others. Why do we have to learn punctuation rules? Easy — because it’s essential for helping you communicate clearly in writing — something everyone will have to do at some point his life. Why do we have to read To Kill a Mockingbird? That one’s trickier. I would usually say something like, “Because it’s a wonderful book full of memorable characters that will tug at your heart and shed light on issues of race in the American South during the 1930s.” But that wasn’t what they were asking. The student was looking for some practical application. Some way that reading this book would help them be successful in a future career. This interchange came back to me when students started challenging me the same way. It doesn’t make sense to teach kids stuff just because there’s some remote possibility that they may choose a career in which that knowledge is needed. Is education really just a big buffet line where you get to sample all the dishes until you find one you really like? One day I was in the mall and saw a poster promoting math education. It was an image of an astronaut floating in space with the words, Study Math. I thought to myself, “How many kids is this poster really going to influence? How many people really aspire to be astronauts?” There’s a better chance of playing in the NBA than floating in space for a living. It seemed a pretty unpersuasive ad. Don’t get me wrong. An important part of education is preparing students for an eventual career. We want kids to enter the job market with skills that will help them provide for themselves and their families and to make a valuable contribution to society. But is that all education is about? Is it just getting students ready for work? I’ve heard other teachers answer the question by saying, “You’ll need to know this in college.” But that seems even worse than the “maybe you’ll need this in your job one day” answer. It’s just saying, “you need to know this so that later you can know this.” The logical next question is, “Why will I need to know it in college?” Right? There’s an assumption underlying the question, Why do I have to know this? The assumption is that the purpose of acquiring knowledge is to use it in some practical way in the future. The implication is that there’s no point in learning something that you aren’t going to eventually use. How may of us have complained that we spent all those years learning algebra (or history, or biology, or British literature, etc.) but never once used it in our everyday lives? If that’s true, was our classroom experience simply a waste of time? I don’t think so, and I’ll explain how Plato helped me get my brain around this in Part 2. Bloggers love comments like politicians love votes. Support your favorite blogger (a.k.a, me) by posting something in the Reply section below. I am also looking forward to part two. I have used all the above reasons at some point or another. The buffet illustration was a deliciously concise synopsis of the educational philosophy of many. Never really did it for me. Part 2 is up and available, RG. Thanks for your comment. It implies that knowledge “for the sake of knowledge” is a worthy goal, perhaps the ultimate goal in Feynman’s opinion. I disagree. But Feynman was a beautiful character. Few people have his burning desire “to know” and the ability to figure out so many new things. When we get people like that we should cherish and nourish them. But for me and everyone else knowledge is still the best investment you can make to improve your life and lives of those you care about. The question is not whether you should learn THIS. You should learn as much as you are capable of learning. The question is whether should learn THIS, as opposed to something else. Why should you learn chemistry? because your body runs on chemistry. Your spouse’s and your kids’ bodies will run on chemistry. Chemistry will affect you every day of your life. Chemistry is a key to changing your life, to changing the world. Why should you read To Kill a Mockingbird? because it’s a “shared book” and one of the best books. It’s likely you’ll come across references to it in your life. If you’ve read it you can better participate in culture. If not you’ll be in the dark when that time comes. There are relatively few “shared books” in our culture. Also it will teach you things worth knowing, more so than 99.99% of the other books out there. The problem I have with the education I was given, the type of education we still deliver to children, is not that I learned too many “useless” things. It’s that they left out too many useful things to fit in those less important things. Thank you, Ryan, for this excellent, thoughtful reply. … Like politicians love vote. That’s funny. This was kind of a cliff hanger. Looking forward to part 2. I love to write. I want my kids to catch a little of that from me. It’s been challenging so far… Looking forward to know how Aristotle may help give my kids a reason for the pain, um I mean learning. Leave a Reply to Melinda Click here to cancel reply.